Wood provenancing will be realised by combining three research methodologies and approaches from the Life Sciences, i.e. tree-ring research, wood anatomy and geo/dendrochemistry. This unprecedented approach will be integrated by the fellows in order to provide a set of empirical tools to ascertain the origin of timber found in shipwrecks. Fellows will be responsible for the construction of long tree-ring chronologies from oak and pine originating from different areas in Atlantic Iberia. These data will be merged with existing datasets from the Iberian Peninsula and NW Europe to enable dendrochronological dating and provenancing of timbers from shipwrecks. 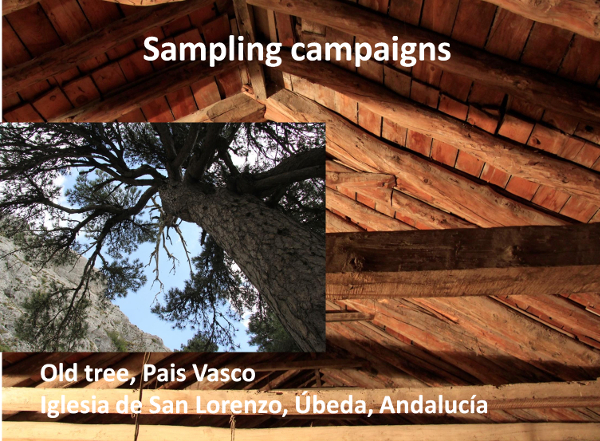 Researchers will undertake the task of developing methods for anatomical characterization of the wood of deciduous oak and pine species used for shipbuilding in Iberia in the Age of Discovery and European expansion. These will include species’ identification, parts of the tree (main stem, branches) and mechanical properties of the wood. Although differentiation of oak and pine species is straightforward by the observation of the living trees, this has not been successfully achieved by the study of their wood anatomy yet. This is crucial to determine whether a ship was built in an Iberian shipyard or elsewhere, as oak and pine timber for shipbuilding was imported to Iberia in the Early Modern Period, but Iberian timber was not exported elsewhere for this use. If e.g. Quercus faginea or Q. pyrenaica, which are endemic to the Iberian Peninsula are found in great amounts as original structural timbers in a ship, it could be an indication that the ship was built in an Iberian shipyard. Simultaneously, researcher will assess the use of the elemental and isotopic composition of the wood as a fingerprinting to develop a model for identifying its provenance; as trees mine soils for nutrients, they also incorporate other elements present in the minerals and the soil solution. Therefore, the geochemical composition of wood reflects the local lithology, offering good prospects for the identification of the provenance. The extraction of isotopic biomarkers in the wood from living trees and waterlogged timbers from the researched shipwrecks will be investigated. Wood provenancing will be realised by combining three research methodologies and approaches from the Life Sciences, i.e. 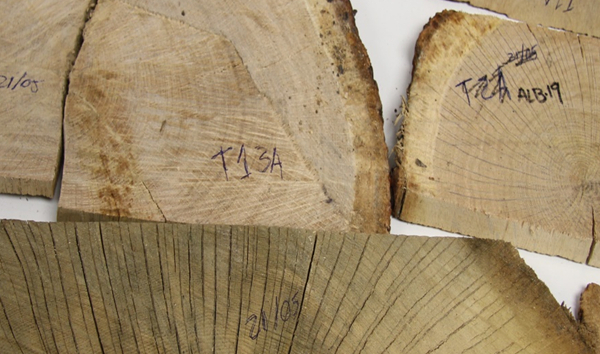 tree-ring research, wood anatomy and dendro/geochemistry. This unprecedented approach will be integrated by ER3 in order to provide a set of empirical tools to ascertain the origin of timber found in shipwrecks. ESR9 will be responsible for the construction of long tree-ring chronologies from oak and pine originating from different areas in Atlantic Iberia. These data will be merged with existing datasets from the Iberian Peninsula and NW Europe to enable dendrochronological dating and provenancing of timbers from shipwrecks. ESR10 will undertake the task of developing methods for anatomical characterization of the wood of deciduous oak and pine species used for shipbuilding in Iberia in the Age of Discovery and European expansion. These will include species’ identification, parts of the tree (main stem, branches) and mechanical properties of the wood. Although differentiation of oak and pine species is straightforward by the observation of the living trees, this has not been successfully achieved by the study of their wood anatomy yet. This is crucial to determine whether a ship was built in an Iberian shipyard or elsewhere, as oak and pine timber for shipbuilding was imported to Iberia in the Early Modern Period, but Iberian timber was not exported elsewhere for this use. If e.g. Quercus faginea or Q. pyrenaica, which are endemic to the Iberian Peninsula are found in great amounts as original structural timbers in a ship, it could be an indication that the ship was built in an Iberian shipyard. Simultaneously, ESR11 will assess the use of the elemental and isotopic composition of the wood as a fingerprinting to develop a model for identifying its provenance; as trees mine soils for nutrients, they also incorporate other elements present in the minerals and the soil solution. Therefore, the geochemical composition of wood reflects the local lithology, offering good prospects for the identification of the provenance. ESR12 will investigate the extraction of isotopic biomarkers in the wood from living trees and waterlogged timbers from the researched shipwrecks. Tree-ring research: As a first step, oak and pine forest stands will be selected and sampled in areas of Atlantic Iberia (Cantabrian, Basque and Andalusian Spanish regions and Portugal) identified by ESR1 and ESR2 (WP1) as suppliers of timber for shipbuilding in the 16th and 17th centuries. The selected sites (at least three per area) will provide groups of contemporary samples representing known geographical areas, and covering the most recent centuries continuously until the present. 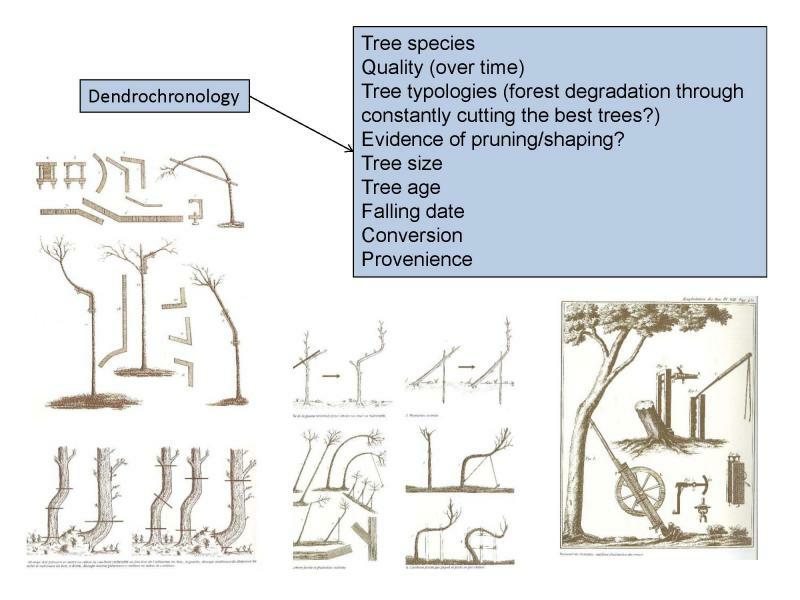 Sampled trees (at least 30 per site, selected by ESR9 and ESR10) will comprise old individuals to achieve long tree-ring chronologies, but also younger trees (up to 100 years old), to assess impacts of forest management gained from (historic) archives. Samples will be researched following standard dendrochronological methods and using equipment specifically designed for tree-ring research (TimeTable measuring devices; software programs PAST4, COFECHA, ARSTAN), To extend the created tree-ring chronologies of living trees back to the 16th century and beyond (period covered by the trees used to build ships of the Age of Discovery), wooden roof structures of buildings offer the best prospects, as they contain local timber that may serve as link between the living trees and the wood from the shipwrecks. For this purpose, two to five historical buildings (e.g., churches, cathedrals, monasteries) will be targeted in the surroundings of the timber-supplying areas, following the successful approach used by K. Richter and T. Wazny in the development of long-span reference chronologies for eastern Iberia and Poland respectively . Wood anatomy: ESR10 will identify ecological wood anatomy markers in the samples from living trees collected by ESR9 to (i) enable species differentiation for oaks (Quercus robur, Q. petraea, Q. faginea, Q. pyrenaica) and pines (Pinus sylvestris and P. nigra) most commonly used for shipbuilding in Atlantic Iberia and the North of Europe during the 16th to 18th centuries, (ii) identify the properties of the wood used in shipbuilding and historical construction, and (iii) increase reliability of dendroprovenancing based on tree-ring width by including additional anatomical variables that reflect ecological site conditions in the targeted areas. Once the markers have been identified for living trees (hence known species), the validity of this approach can be tested on timbers from historic buildings before being applied to samples collected from shipwrecks by the ESRs/ER from WP2. If necessary, genetic analyses could be performed at reference laboratories in order to complement species identification based on wood anatomical features. Dendro/geochemistry: soil and rainwater samples will be collected at the sites where the living trees are sampled. Wood samples will be taken in collaboration with ESR9 and ESR10. Elemental and isotopic compositions will be determined using a set of techniques (AAS, XRF, ICP-MS) available at the USC or in reference laboratories (for Sr isotopes, for example) (ESR11). In all cases, certified standard reference materials will be used for quality control of the analyses. As a complementary, general-purpose characterization technique, we intend to use infrared spectroscopy (FT-IR) on wood samples (both, living trees and timber-finds). In conjunction with PLS modelling, this technique may be of great help to study wood organic composition. Additionally, ESR12 will assess possible diagenetical effects on the composition of timber-finds due to burial and/or prolonged immersion in sea water.